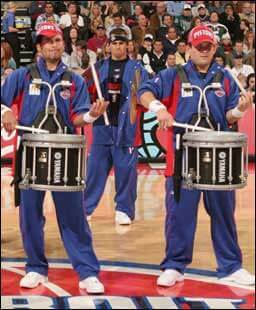 Alums of the Cadets, Phantom Regiment, Santa Clara Vanguard, Madison Scouts and Glassmen, who are regular members of the Detroit Pistons drum line, are scheduled to team up with Kid Rock tonight on the Jimmy Kimmel show (ABC television -- check your local listings for time and station). "He (Kid Rock -- a big Detroit Pistons fan) saw us at a basketball game. His tour manager called me that day after," said Todd Ohme, who heads up the drum line. Ohme is a tenor drum player who won the 1998 I & E championship (as a member of the Glassmen) and later taught the Crossmen. The ensemble will perform the Kid Rock hits "Bawitdaba" and "Welcome to the Party." One song will appear at the beginning of the show, one at the end, according to Ohme. Ohme said that the rehearsals have been "really raw" thus far, and that the performance will be a little more "free-form" than a typical DCI performance. The rest of the drum line is made up of students and alums from Michigan State University. They will perform at the upcoming NBA all-star game. Kimmel's show is broadcasting from Detroit this week in anticipation of the Super Bowl on Sunday.